Please visit http://march20sds.wordpress.com to sign on to a call to action for 2008! This March will mark a grim milestone - the fifth anniversary of the illegal and immoral invasion of Iraq. Despite the clear mandate from the American people to end the occupation, the U.S. government continues to wage war upon the Iraqi people. Bush’s mocking response to dwindling public support for the war has been the “troop surge,” or simply more of the same, while simultaneously threatening neighboring countries like Iran. For their part, the Democrats refuse to commit to a clear anti-war stance, even as they try to posture as the opposition party. Meanwhile, the threat of domestic recession looms, racist attacks increase, and millions lack decent housing, jobs, education, and health-care. The war will drag on for many more years–draining billions of dollars and resulting in thousands of more causalities, both American and Iraqi, on top of the hundreds of thousands already killed, injured, and displaced–unless the people stand up and fight for change. Every year, there have been protests marking the anniversary of the U.S.-led invasion of Iraq that was launched on the basis of lies and deceit. Students have historically had an especially important role in the struggles against racism and war, and we continue to do so today. Last March, over 80 high schools and colleges answered the call by chapters of Students for a Democratic Society to come together to send one loud resounding NO to the Bush administration and the Republican agenda, to the Democrats who refuse to carry out the mandate of their constituents, and to the University administrations that so often support war efforts. This March, SDS is urging all students, as part of the broader community of people of conscience, to voice our opposition to the war in Iraq. As the presidential election nears, candidates need to be sent a clear message: we will not stand for vague time lines and empty promises, we will not tolerate sanctions, threats, and aggression against Iran, and that we will stand in solidarity with the Iraqi people who are struggling to liberate their country. We want as many people as possible to join us in this protest; the larger the protest the stronger the impact we have, and the sooner we can help end this war. We are calling on any and all student and youth based organizations that are opposed to the war in Iraq to mobilize their memberships, their campus, their community and hit the streets for the week of March 17-21, with March 20 as the focal point. * We are calling on students to take action on their own campuses, where we have the power to reach the entire student body with our message and build resistance on our own campuses. We are calling on our fellow students and youth to take the lead and do whatever it takes–from rallies, marches, walk-outs, civil disobedience, and direct action–to send a clear message to the U.S. government: Get out of Iraq Now! GET ORGANIZED, GET INVOLVED, GET IN THE STREETS! Contact march20sds@gmail.com if you would like to sign on to the call. *This call is flexible so that each campus/community can organize an action that works best for them. For instance, if March 20th is an inconvenient date due to Spring Break, actions can be held in the weeks prior to or after 3/20. We are encouraging those who are on spring break during this week to mobilize their chapters to participate in the anti-war actions being held in D.C. on the 19th; for more information on the actions in DC, email dcsds@riseup.net. Here is a list of links to press coverage that the March 20 mobilization has received. Please email us to let us know about any coverage you get or you see so we can add it to the list. On March 20, thousands of students and young people across the country participated in one of the largest coordinated student protests in recent history. Students for a Democratic Society (SDS) originally put out the call for schools to organize and demonstrate against the Iraq War on its fourth anniversary. All across the United States - from the Northeast campuses of Harvard and Rutgers, to Southern schools of Tuscaloosa, Alabama and Winthrop in South Carolina; from high schools in Raleigh, North Carolina to Santa Rosa, California; and Midwestern campuses in Minnesota and Michigan - students have walked out of classes, rallied in their communities, and spoken out against the war in Iraq. Kati Ketz of the University of North Carolina-Asheville SDS, one of the lead organizers of the national day of action, said, "March 20th has turned out to be an amazing day of coordinated actions around the country against the war and occupation of Iraq. 84 schools in total signed on to the call to action, and thousands of students walked out of their classes, had die-ins, and participated in other forms of resistance in what was possibly the largest single day of student action since the Vietnam war." She continues, "We need to continue with this momentum and keep building the student anti-war movement. This is only the beginning of a new wave of student activism. As students have been chanting, 'Stop the war? Yes we can! SDS is back again!'" "The student movement here in Chicago is clearly coming alive. The UIC campus rally attracted some 200 students, most of whom walked out or missed classes to participate. The city-wide student and youth contingent, also about 200 in size, demonstrated strong unity and organization," said Stan Huculak of the University of Illinois at Chicago Students for Social Justice. The U.S. has now entered its fifth year in Iraq, and the Bush administration is further escalating U.S. military presence in the midst of vast unpopularity. Bush and company plead for "more patience" on the eve of the fourth anniversary - but we have already waited far too long. March 20 was a testament to the power of a revitalized student movement, and we will continue to demand an immediate end to the war as it drags on. These are the schools we know of that are participating in the March 20 student anti-war day of action. Leave a comment here or email march20antiwar (at) hotmail.com if your school is doing something and we'll add you to the list! 29. NYU Campus Anti-War Network: Walk-Out and rally at Washington Square Park. 63. Grand Valley State University College Democrats (Michigan): Iraq awareness week, including tabling and a rally. 65. Wright College Students for Peace and Justice (Chicago): 3:15pm send-off rally to the larger Chicago student march down Michigan Ave.
72. Lincoln Park High School (Chicago): Attending student/youth rally and feeder march at 4 pm, University Center, downtown Chicago. Rumors of a Clandestine Clown Army Marching Band abound. And these are the organizations that have endorsed the call to action! 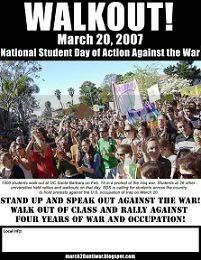 On the eve of March 20th - a national day of student actions against the war in Iraq - 78 schools are signed on to the call. Schools all across the nation are having walk-outs and rallies; teach-ins and speak-outs; wearing armbands and waving flags; and participating in other forms of resistance to the war. Students for a Democratic Society (SDS), a multi-issue radical student organization, was recently re-formed this past year by students recognizing the need for young people to become active in the national anti-war movement. The call for the protest was originally created at an SDS meeting after the School of the Americas Watch demonstration last November at Ft. Benning, Georgia. There, over 100 organizers from 20 different schools from around the country gathered and unanimously voted to make March 20, the fourth anniversary of the Iraq War, a national day of student resistance to the war. Kati Ketz of the University of North Carolina-Asheville SDS, one of the lead organizers for the March 20 day of action, said, "It's incredibly inspiring to see students taking up this call to action and organizing on a local level. Students are becoming united and organized across the country against the war, and we're really going to see a new student movement emerge out of these actions." "Rutgers is going to have its largest walkout since the 70's. Hundreds of students will be walking out as well as several teachers. We have such a critical mass that we even got the student governing association to endorse it," said Ian Chinich of Rutgers Against the War. "There has been a very positive response from all of the high schools I have contacted. It seems like once one high school signed on, all of the others joined in much more readily. They saw that other kids were taking advantage of this amazing chance to create peace, and decided they should too!" said Moriah Arnold, from Green Hope High School SDS in Cary, North Carolina. As the U.S. enters its fifth year in Iraq, the Bush administration is further escalating U.S. military presence in the midst of vast unpopularity. What started as 27 schools on the west coast striking and demonstrating on February 15th is now growing into a national student movement against the war. Tomorrow on March 20, tens of thousands of students and young people in 78 schools across the U.S. will take part in a nationwide coordinated protest. These are organizing reports from schools building for March 20 actions. Email in your report on what you are doing to build for March 20 and how things are going at your school! The idea is to get ideas from these reports to use at your schools too. On March 20th, we at the University of Illinois at Chicago have a walkout planned for 11:30am and a rally in the quad at 12:00pm with other progressive groups at UIC. During the rally we'll have several speakers. These include Bill Ayers--a former leader of SDS in the 1960s and a current professor in the UIC Education Department. A couple of members of IVAW will also be speaking as well as many others. At 4:00pm, we're calling on students across Chicago to assemble at University Center (located on State and Congress) where we're having another rally. From here, at 5:00pm we're having a student feeder march to Bughouse Square where we'll link up with the main march planned for Chicago. In order to get a large turnout we've been doing traditional things like putting up posters across campus as well as fliering at main student gathering places. However, we also tried a new tactic. We approached progressive faculty members and asked them if we could tell students in their classes about the March 20th events and distribute fliers. Many professors were excited and agreed to this. By passing out fliers in a classroom setting we can talk to the students and describe the events in much more detail. A couple of professors even agreed to cancel their classes on the 20th. UIC SDS is going to be at the M-17 demo in Washington, and there might be some folks coming from Depaul SDS. Chicago SDS is organizing a united student youth block at the University Center, also known as the superdorm since it houses students from three universities, because the military is putting in a new recruitment center there in the spring. We are also hyping up a walkout among highschoolers, people at Columbia College are going to be holding events all day with teach-ins and street theatre, UIC is holding a rally before the student bloc and I'm not sure what Depaul is doing. Elmhurst College SDS will just be attending (Hurray for having an SDS at a college with 1,500 kids with family incomes over 100,000). We are doing a walkout/ rally in front of our main auditorium on Winthrop's campus. We're located in Rock Hill, SC. We actually don't yet have a chapter of SDS at Winthrop, but the Socialist Student Union is putting together the demonstration for March 20th in alliance with SDS. We've gotten a late start, but to get the word out, we've mostly just been flyering and talking to people. I've gotten the best response from classmates and professors who I've just talked to for about 5 minutes, explaining the action and the cause, and most of them are happy to join. Hopefully, that will translate to Tuesday and actually make a successful event. Monday, March 19th, which is the day our school starts back from spring break, we will be handbilling all day long, and trying to talk to people as much as possible, to remind those who know already and to get new people to sign on. Our faculty advisors are sending out all faculty emails to get faculty members on board. A couple of our members are making banners. Sunday before the demonstration, we are having a final organizing meeting and will be sliding quarter sheets under faculty office doors, while a few of us are going to try and get into the dorm buildings to talk to people there. Here's what the Kennesaw State University Greens have going on: We're handing out flyers to build up to the events we're having and black armbands with the number 650,000 to represent the number of Iraqi dead and 3,000+ to represent the U.S. soldiers dead. We're encouraging everyone to wear them on the 20th to increase visibility. We're participating in a "teach-in" at our senators' offices on March 19, along with a larger statewide coalition, the Georgia Peace & Justice Coalition, 9 am-4 pm. It's a basic filibuster technique to put the pressure on our senators. Although neither of them will be there, their staff will surely report back to Washington. For actual on-campus events on March 20, we are setting up educational and interactive stations. For example, we are going to have a "wall of dissent" or canvas people can write on to share their thoughts about the war. We are also chalking names of victims of the war, setting up a station that shows the amount of money spent on war as opposed to that spent on education, and tents with information about people displaced because of the war. Animas SDS mobilizing a Radical Youth Contingent for our local anti-war action, which is going to be on the 18th. We will also be representing at a candle-light vigil the next day. Two people will be in DC. On the 20th we will be holding a classroom occupation action to mark the anniversary, and will be screening documentary films and holding discussions. Films we already have lined up include "Hijacking Catastrophe," "The Oil Factor," "Iraq for Sale," "The Ground Truth," "Arlington West," and more. Here at the University of North Carolina at Chapel Hill we are working hard to get the word out about the walk out and rally we have planned for March 20th. For the past two weeks SDS members have been going door-to-door in the dorms asking students to pledge to leave class. We have found this to be an excellent way to engage people in brief dialogues about the war. A number of the folks we spoke with had already heard about the walk out, either from flyers around campus, seeing the Facebook group we created online, or through their friends. We are expecting to see a lot of new faces at the rally on March 20th. Monday, March 19th is the day that UNC students get back from Spring Break. On that day we are planning a die-in at the center of campus in order to publicize the walk out. On the 20th we are going to have a really high-energy rally in this same area of campus (“the Pit,” an extremely high-traffic area at noon on a school day). We will enjoy a few brief, fiery speeches, drumming and samba music from a fantastic Greensboro group called Cackalack Thunder, and the spoken word talents of members of the UNC Black Student Movement, then we're taking it to the streets! Good luck with all your organizing! Plans at UIC: Walk out of Class at 11:30 a.m., march across campus. We're going to chant, "You want the troops out? Get up and walk out!," and "Want out of Iraq? Get up and walk!" (Reminder: "Iraq" rhymes with "walk"8=) Rally at noon in the center of campus, where speakers will include UIC professor Bill Ayers, a leader in Vietnam era Students for a Democrat Society,and grad student Nader Abusumayah of the Palestine Solidarity Group. At 4:00 pm, we'll join students and youth from other schools downtown Chicago, march to Bughouse Square, join the citywide rally there, and then march down Michigan Avenue. Rutgers Against the War originally put out the call for a walkout over a month ago. Since then, we have organized with a variety of other groups including cultural groups. We fliered buildings throughout our school multiple times, handed out 7 or 8 thousand handbills, gave speeches about the walkout in multiple classes, and dorm stormed throughout the whole school. We also began banner dropping and have already unfurled 4! Our work has been paying off. We have a list of teachers who endorsed the walkout and another one of teachers who are walking out with their students. The Rutgers College Governing Association has also recently endorsed the walkout. We currently have over 333 people RSVPed on facebook and we are expecting many more. We are expecting several hundred people to walkout. Brown SDS is organizing a die-in to protest Textron, Inc., a war profiteer best known for clustser-bombs and Cobra attack helicopters. The organization, with billions in assets and 20,000 employees world-wide, has their headquarters in downtown Providence, RI. We'll head down to the HQ, where people dressed as Textron executives will stand on the landing outside the building, and with bloody hands, throw fake clusterbombs on the rest of us, who will pantomime agonizing deaths. The street-theater is a fun, easy stunt to get some good press and embarrass the company by illustrating the effect of their company. Right now, we're contacting press and sending out calls to other students to swell our ranks. On the same day, separate from the actions, we'll be doing a banner drop off a centrally located building, something to the tune of "Not Another Death; Not Another Dollar; In Defense of US Empire"
In response to the Students for a Democratic Society's call for a national student day of action against the war in Iraq ( http://www.march20antiwar.blogspot.com ), Gainesville Area SDS (http://facebook.com/group.php?gid=2217745874) is calling for a MASS DEMONSTRATION and RALLY on Tuesday March 20th, @ 1 pm in the Reitz Union Colonnade, followed by a MARCH to Tigert Hall to demand that UF: 1) provide an audit of all UF investments (totaling in the billions) and end business with companies related to the war industries; 2) inform students of all war related research being conducted on campus; 3) publicly declare UF's opposition to this illegal war and the continued occupation of Iraq. It should be obvious by now that even a clear mandate in the electoral arena is not enough to stop this war. No longer will we make the mistake of relying on politicians to represent our voice -- we will take our demands to the streets and we will reclaim our voices as our own. We simply cannot conscionably allow these actions (and our "representatives'" inaction) to continue unopposed. In anticipation of the March 20th student day of action, I have worked on organizing with several schools in the Cary/Raleigh area. Though being in a southern area has caused a lot of resistance from not only the administration, but also from the students, four high schools in this area alone have signed on! At my own school, Green Hope High, around thirty people have shown interest in participating. Considering the school has close to 3,000 kids, that's definitely not a lot, but the number seems to keep growing and hopefully soon there will be a lot more! We started out by going to the principal and asking about the rules regarding protesting. The only requirement by law (besides the obvious ones such as not being violent) is that we cannot cause a disturbance in the "learning day." This means lunch, before school, and after school are the easiest times to have a demonstration or rally. We decided to go a different route and call for students to wear black armbands, bandannas, or whatever else they may own that is black with peace signs on them. We are also planning on having a demonstration at lunch, consisting of about fifteen kids going from table to table with a large banner that reads something like "stop the bloodshed," while a few of the students stand in front of it and sing John Lennon's "Give Peace a Chance." All of this has been approved by the principal and you CAN NOT get in trouble for participating in them. Our principal did however make it very clear that walking out would not be acceptable. We plan to do this anyway, just in much smaller numbers, since most students fear of being suspended. After we walk out, we are working on getting transportation to the rally in Chapel Hill. Other schools, such as Enloe High School (which is much more liberal), also plan to join us in walking out. I have heard ideas, such as acting out war scenes, or at a specific time having everyone in class play dead to represent everyone who has died in this war. Some groups of kids are even walking out and playing songs about the horrors of the war on their guitars. The only thing we're afraid of is the part of the student body that is very much for the war. Even the administration warned us that people who oppose our views may try push their views through violence, and since the group in my school that is still for the war is much bigger than the group that is against it right now, this could be a problem. Despite this, we will continue with our protest. In the words of Kimya Dawson, "we wont stop until somebody calls the cops, and even then we'll start again and just pretend like nothing ever happened!" I urge you all to get your school involved and help out! This is going to be a truly historic day! Good luck! To moblize students for the March 20th rally, we've tabled several times and passed out handbills. Our campus is 1) very enormous and 2) very conservative, so we've faced some obstacles in getting the word out. We organized a discussion about the week of student unrest that happened here back in 1970, which I think was really inspiring to a lot of students. There is basically zero activism of any type here, and even people who are strongly against the war tend to have a very defeatist attitude. We have organized a campaign to protest the shady dealings of the university administration, which has united hundreds of students. We're going to try and use that event to publicize for the 20th. We had a die-in (students laid in front of the Student Union during lunch hour in bloody t-shirts and gave antiwar speeches on a megaphone) which drew a LOT of attention to the war, as well as to SDS and the 3/20 event. Unfortunately, our spring break is the week before 3/20, which puts us at a disadvantage. Also, our chalking was buried amid candidates' names for the upcoming SGA elections, and our flyers get ripped down very quickly. Still, we should get a decent sized crowd out for the 20th, hopefully enough to march downtown to the Federal Building. I've noticed that it has really mattered that we are not acting alone that day; not only do other SDSers get excited when they hear what other chapters are up to, but people seem more committed to come to our rally when they realize it's a nation-wide event. We can't wait - it's going to be so powerful to have that many student protests on one day! Students report back on organizing efforts! Check out the Facebook page for the March 20 Day of Action!